A lot of my Fit Mums and Park Fitters are asking me (possibly complaining but I’ll assume asking for the purposes of this post) about muscle soreness so I thought I would write a little blog post to help you all out!! Delayed Onset Muscle Soreness (DOMS) often occurs a day or two after heavy exercise. It is often described as stiffness, soreness, inflammation and tenderness. This stiffness and soreness is felt in the main muscle groups that you worked in your last exercise session. It is eccentric movement that causes DOMS. An example of eccentric movement is when you slowly lower your arms in a bicep curl. Funny story. I got DOMS in my biceps after I gave birth to my son. I had had an epidural and was instructed to hold on to the back of my knees and pull (eccentric contraction). I swear my biceps hurt more than anything else in those 72 hours after labour!!!! Ditch the weights, push out a baby!!!! You are more likely to feel DOMS if you are new to exercise or when you increase the intensity of your workouts. What you will be pleased to hear is that after the first bout of DOMS is often the worst and then you are protected from damage from subsequent exercise for up to six weeks. This gives you time to gradually ease into your workouts and increase the intensity over time. Basically this means that once that first session is out of the way, you need to continue with the exercise to avoid getting DOMS as bad!! 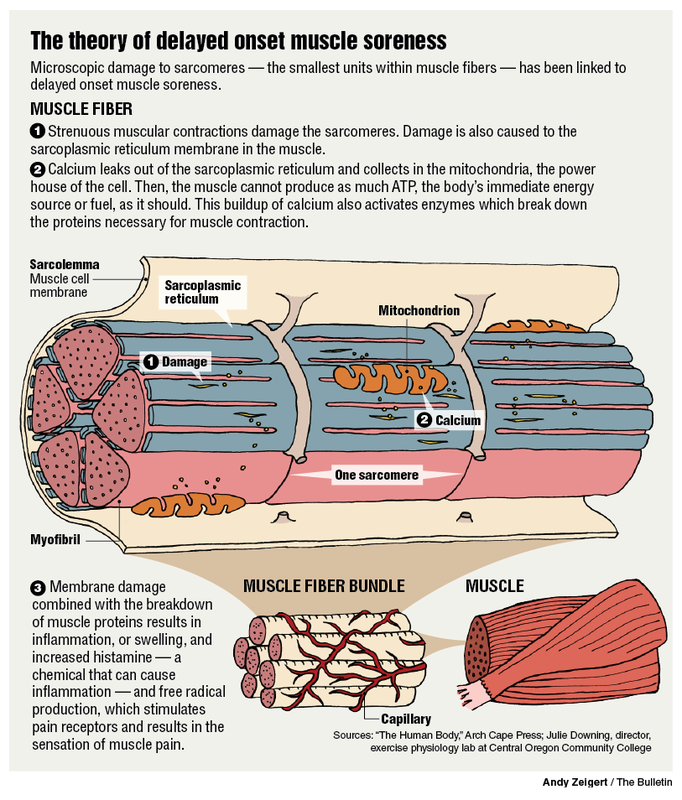 The precise cause of muscle soreness is unknown. DOMS can be produced by a number of different factors. The best thing you can do speed up recovery if you are experiencing DOMS is to keep moving!! Avoid the temptation to sit down and not move for a week! DOMS isn’t an injury so very low intensity exercise such as walking or swimming will help to loosen the muscles. Stretching daily will also help, but especially after exercise. This will help to lengthen the muscle fibres and increase the blood flow to the muscles. This increase in blood flow helps to bring vital nutrients and oxygen to the muscles to aid recovery but also flushes out the waste products. Drinking plenty of water and massage will also help with this process. Warm baths can help to relax the muscles affected and ease the soreness. Adding two cupfuls of magnesium flakes will also help to feed the muscles and replace minerals. Stay in the bath for at least twenty minutes to allow the magnesium to absorb through your skin. My favourite magnesium flakes are from Better You (another fabulous company based in Sheffield!!). Ensure you have plenty of protein in your diet to help feed and repair the muscles. A few spoonfuls of cottage cheese before bed is a great source of protein that acts to repair the muscles while you sleep. If you struggle to get enough protein in your diet there is the option of protein shakes. These are fast acting and provide your muscles with instant “food” to help kick start the healing process and thereby reducing the severity of DOMS. Protein powders are a massive money making industry and a bit of a minefield that I could write a whole topic of blogs on (watch this space!). All I will say for now is that it is down to personal preference so don’t go out and buy a massive tub! Try some trial packs until you find one that you like the taste and consistency of!! Chocolate milk drank within thirty minutes after exercise, has also been shown in recent studies to have positive effects on reducing muscle soreness after exercise and is a cheaper alternative to protein powders (yet another blog post, I’m starting a list!!). Yes I am telling you to go drink chocolate after exercise, it helps. I promise. You can thank me by sending this blog to all your friends and letting them know about it too!! !